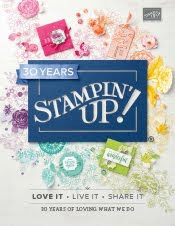 Just Julie B's Stampin' Space: Shakin' it Up for Friday! Here is a super fun card we'll be making in class this Friday (or Saturday)! I just love these new Shaker Frames from the Holiday Mini catalog. They make creating a Shaker Card so much easier! No more piecing together parts from your Dimensionals pack. It took me a couple times of going through my Spice Cake Designer papers to finally discover this awesome paisley/flowery print - I LOVE it!! So I used the color scheme from that to create the colors for the layers. It uses Pear Pizzazz, Soft Suede, River Rock and Vanilla - nice soothing fall colors! And don'tcha just love this little shaker window?! After putting together the layers it just sticks on to the card front - I love that! And inside the window is our new Mica Flakes from the Holiday Mini. They're perfect in the shaker because they float around so easily - and they're super soft and sparkly. - Love them too! I guess I love a lot of things about this card! I hope you do too! And I hope to see you at Friday's (or Saturday's) class, where you'll get to make one of these cards too! I love the DSP!! Can't wait till Saturday!! Beautiful! Love the layout, papers and shaker window. Your class is going to love this one!